This 3D Hatching Dinosaur Egg really opens, and you can put your own baby dinosaur inside. 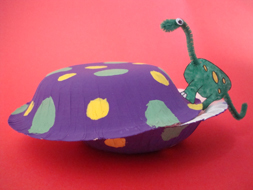 A fun and easy craft for toddlers and preschoolers on up! You can put any dinosaur in your hatching egg, we put our Mini Dinosaur inside our egg. • Dinosaur to put inside, either a paper one that you have colored (try our baby dinosaur) or you can make our Mini Dinosaur craft, like the one in the picture. 1. Paint the bottom of both paper bowls (you can also use markers if you don't have time to wait for paint to dry). 2. Place your bowls together, insert a paper fastener through both bowls and secure. Now move your bowl back and forth to make your egg hatch! 3. Insert a dinosaur into your egg. You can put in a plastic one, use our small dinosaur coloring page, or you can make our Mini Dinosaur craft. This would also make a great loot bag for a dinosaur party, just fill it up with all kinds of goodies!